[updated June 2012] India can reasonably claim to be the spiritual home of vegetarianism, with an unbroken line of countless generations over thousands of years. There are currently about 300 million lacto-vegetarians in India, equal to the entire population of the USA, but the issues there are rather different to those facing us in the west. In India vegetarianism has always been associated with religion, mainly Hindus, Buddhists, and Jains. Today many young people are turning away from their religion, enticed by the consumer-driven western lifestyle, including western style junk-food, for those that can afford it. Attempts to turn them back to traditional lifestyles have not made much progress, but what we have seen over the last few years is a remarkable rise in an Indian adaptation of western-style veganism, especially among young people. As far back as 1889 there were vegetarian societies in India, run by Indians, which were distinct from the religious systems, but they struggled to make much headway. 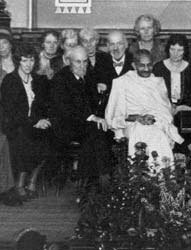 During his student days in London Gandhi had attended an International Vegetarian Congress, and just before he returned home he said he hoped that such an event would be held in India. Sadly that did not happen until nine years after his death. The first IVU World Vegetarian Congress to be held in India was in 1957, and they have been held there several times since then. 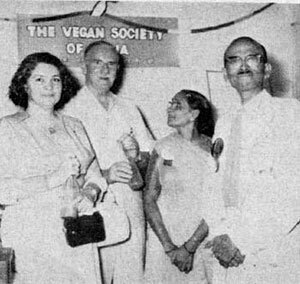 The photo right is a pioneer ‘Vegan Society of India’ at that IVU Congress in 1957. It was perhaps rather ahead of its time and doesn’t seem to have lasted long, but it shows that this is not a new idea in India. 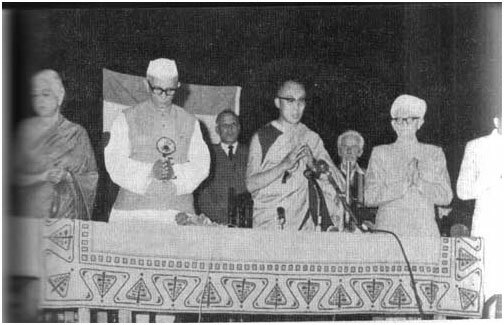 There were more huge IVU Congresses in India in 1967 – opened by the Dalai Lama, below, who was vegetarian at the time – and 1977. All of these were organised by the extraordinary Jayantilal Mankar on the right of the photo. He was a leader of the Bombay Humanitarian League and took each of these Congresses to what were then Bombay, Delhi, Calcutta and Madras. 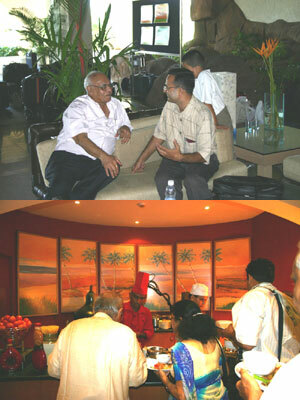 The last IVU World Veg Congress in India was held in Goa in 2006, organised by the great Jashu Shah who is sadly no longer with us. This was at the end of his 18 years as IVU Regional Coordinator, which included launching the Asian Vegetarian Union in 1999. 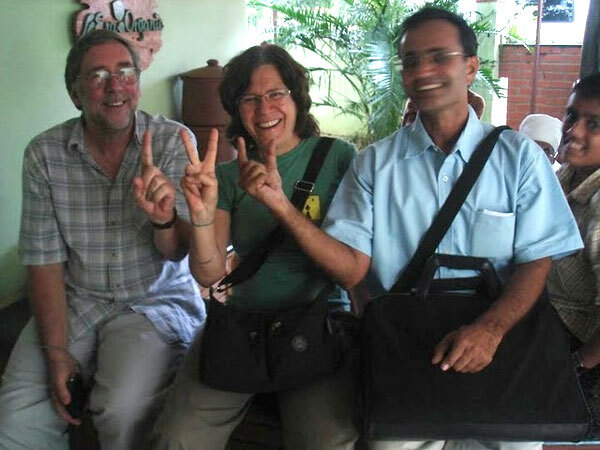 In the top photo, right, Jashu is with Shankar Narayan (on the right) who had just been elected to the IVU International Council. The lower photo is some of the excellent food being served at the Congress – the first major event ever held in India where all the food was vegan. Shankar is the president of the Indian Vegan Society, which immediately puts him at odds with some Hindu and Jain vegetarians who see milk and milk products as an integral part of their religion. But it also sends a clear signal that future progress for the vegetarian movement cannot be entirely dependent upon religion. 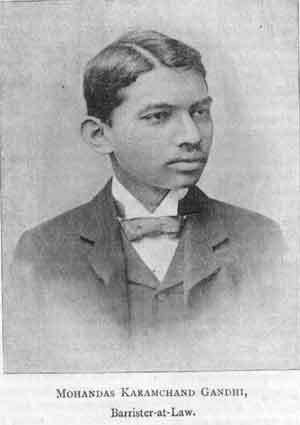 Shankar follows Gandhi's principle of vegetarianism being important in its own right, and seeks to persuade more Indians to follow Gandhi in that decision, whether as lacto-vegetarian or vegan. Following his election Shankar agreed to take on the role of IVU Regional Coordinator for India and South-West Asia (aka the Middle East). He organised the 11th International Vegan Festival in Karnataka in 2007 (see: www.ivu.org/veganfest/2007 ), and has been active in many other events in India. 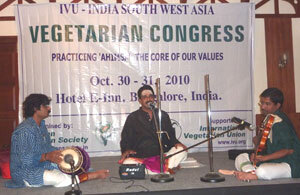 At the end of 2010 the Indian Vegan Society organised a congress for India and South West Asia, held in Bangalore on October 30/31. The photo right is Mohan Santhanam and friends providing some wonderful music during that Congress. 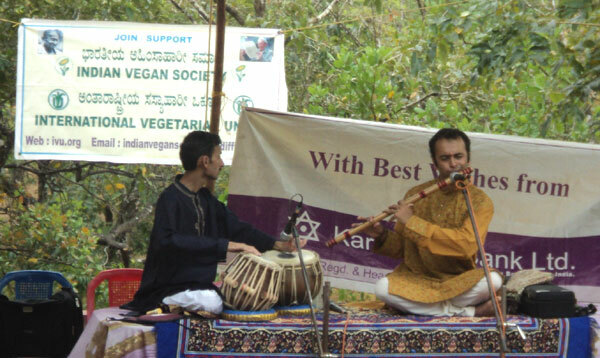 In January 2012 the Indian Vegan Society celebrated its 7th anniversary with a gathering at it base in Karnataka. Only a few years ago veganism was almost unknown in India, but one recent survey estimated an increase from 2,000 to 20,000 vegans since 2006.